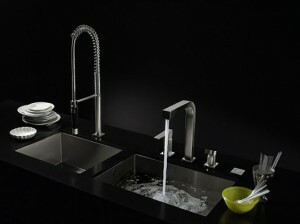 Striking-Black-Cloaked-Minimalist-Kitchen-Sinks-By-Dornbrach - Ace Plumbing Inc. I would like to know if you have 35 Inch by 18 Inch Combo 2-Bowl Kitchen Sink. If you don’t have this size in stock just get back at me with the size you have.I will like to know the price,i will make payment with my credit card.Please advise so we can proceed.Have a nice day.